High speeds clearly run in the genes for the Bryants as the two brothers embark on racing campaigns – on both two and three wheels. Younger brother Will, 25, from Ruyton XI Towns, has entered the Formula 400 and Newcomers classes at the North Gloucestershire (NG) Racing Championships this year. The builder and landscaper has started his debut campaign with success too, coming away with a sixth and second-placed finish during round three of the series, which left him third in the championship. Meanwhile, older sibling Tom has decided he prefers three wheels to two these days and has entered the British Sidecar Championships. So far, despite the usual mechanical problems that can plague sidecar action, he has already scored a sixth-placed finish, during the opening round at Brands Hatch last month. Tom races as a passenger, placing his faith in the driving skills of Nev Jones, from Gainsborough, in Lincolnshire. Tom is also the first to lend a helpful ear and hand in the garage while Will is in action, when not racing himself. “This is my first full season racing, I did about three races last year just to try it out,” said Will. “We have got a bit of family history in racing as my uncle used to be a racer. Will will be riding a Kawasaki ZXR400 throughout the series and admitted a lack of sponsorship meant he would only be able to compete in the NG Racing series this year. He showed his huge potential after leaving rounds four and five temporarily leading the Formula 400 class, as well as winning first Newcomers 500 race, leaving Donington Park with three trophies, which meant he no longer had to wear his ‘newcomer’s’ orange bib. Both brothers were also in action during rounds six and seven of the series, with Will aiming to increase his championship lead while Tom used the meeting for some much-needed track time before the next British sidecar round. With Cadwell Park being another new track for Will he was happy to leave the round second in both the Formula 400 and Newcomers series. Tom also brought his sidecar home second on two occasions, despite losing his brakes at one point. Will, who started from pole during the first Formula 400 race, said: “I felt good on the bike and managed to keep ahead of my close rivals until the second to last lap when I crashed out racing on the limit. All credit to my family and friends who helped me fix my bike in time for race two. “Because of the crash, I had to start from the back of the grid but managed to fight my way through most of the pack to finish fourth from 38th on the grid. Will, returning 400 action, ended both of Sunday’s races in second. 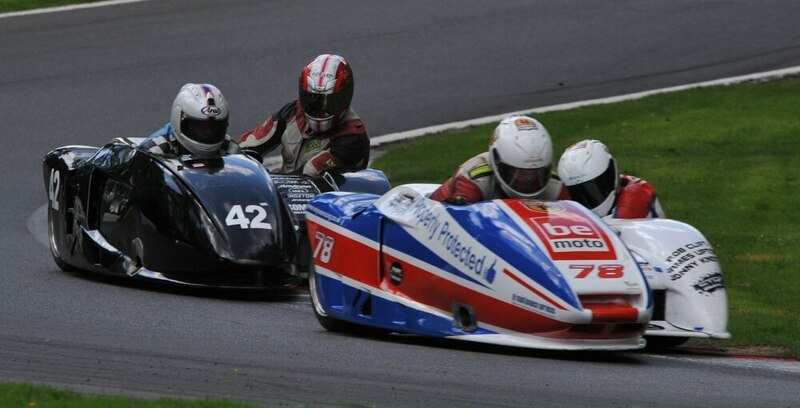 Meanwhile, passenger Tom and driver Jones – having been dealt two ‘did not finish’ results after four races and two rounds of the British sidecar series following his impressive sixth place in the opening round – started off the back in the qualifying race at Cadwell. Despite losing their brakes with a couple of laps to go, the duo just made it to the flag in second, posting their fastest ever time around the circuit . The lead changed three times in three corners during the the championship trophy race but the pairing eventually settled into a steady rhythm in second place. After the brakes again went with a couple of laps to go, they lost a place with two corners to go but had just enough power to take the position back, crossing the line 0.01 seconds ahead third. “It was a great day with good clean racing, which was lots of fun,” said Tom. Round three of the BSB/RKB F1 Sidecar Championship takes place at Knockhill, Scotland, June 16-18. Will is back in action for rounds eight and nine of N G Road Racing championships at Castle Combe, July 8-9.